Here at Athina Sporting we consider driven woodcock to be the cream of driven shooting in the UK. Woodcock and snipe make for an incredibly difficult bird both to drive effectively and to successfully hit when it comes over the guns. We have limited access to destinations which can afford this great sport. Typically located either in Scotland or down in the West Country, but there are also limited opportunities to shoot within casting distance of London. We can of course arrange bespoke trips for groups, or if you are an individual gun then just drop us a line and we can let you know what we have planned and if there is any availability. For those who like to watch the dogs work whilst they are shooting, we can offer some walked up shooting for woodcock and snipe. This type of sport lends itself to teams of 2-6 guns and is a very informal affair. Similar to the mixed bag rough shots, these events are held in areas where the secondary species are less prevalent. With fewer pheasants and subsequently less disturbance, the woodcock get the peace which they seek in their dense woodland retreats. 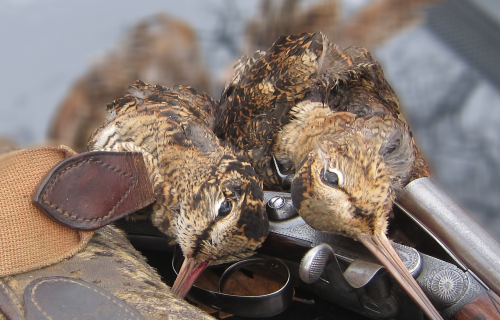 Snipe are a great favourite of ours to shoot on walked up days. With their fast jinking flight a test for most guns. When the snipe are in they can give some really exciting sport, with almost constant shooting as you move through the bog. If you have the legs to walk through boggy ground and the reflexes to shoot this fast, departing little bird then you will love snipe shooting as much as we do. Migratory, quick and agile. Woodcock are capable of displaying incredibly erratic, swooping flight patterns sure to challenge even the most seasoned of Guns. A high level of fitness and stamina is required for shooting walked up woodcock and snipe. Be prepared for boggy ground and plenty of walking. But your perseverance is sure to be rewarded! We currently have limited availability on three dates this coming season for walked up and woodcock shooting in New Galloway. Places for six guns per day are on offer, with guns shooting both days back to back. Prices are £150 +VAT per gun, per day (£360 for both Friday and Saturday). Accommodation and transfers can be arranged upon request – please contact us for further information or to book your place on one of these exclusive trips.